New from Prime Archery for 2019 is the Prime Logic CT9. The Prime Logic CT9 is a much improved descendant of the Centergy and Logic lineup from previous years. As a previous owner of the Prime Logic, I had suggestions on how to make that bow better and Prime really listened. The result is a bow that is taking competitive archery by storm already racking up some major wins and placings in 2019. Let’s take a look at the specs of probably the best target bow of 2019. Draw Weights: 40, 50, 60, 65, 70, and 80 lbs. The features of the Prime Logic CT9 are a combination of all the technological breakthroughs that Prime has developed from the inception of the Centergy all the way to last year’s Logic. We put the original Logic to the test last year and loved it except for a few things. One was the axle to axle length. We felt the Logic was too short (31 inches axle to axle or ATA) and that short ATA length resulted in an undesirable kick due to the center grip and the top cam paying out and taking up more string during the shot. They addressed this for 2019 with the CT3 (33 inch ATA), CT5 (35 inch ATA), and our featured bow, the Prime Logic CT9, which has an ATA of 39 inches. Problem solved. Another improvement that we wished for was a redesigned grip. Last year’s Logic had a very rounded grip that we felt could lead to some inconsistent shots on the shooting line. Prime addressed this issue and delivered an outstanding wider, flatter grip that is one of the most comfortable and consistent of all the bows we tried this year. Enough on the improvements, let’s take a look at what makes this bow such a great performer. 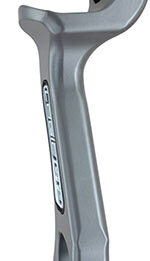 Centergy Technology refers to how the grip of the Prime Logic CT9 is in the physical center of the bow. With the grip in the center of the bow, you will experience a best in class, rock solid hold at full draw. After talking to people who tried out all the bows at the ATA Show in Louisville, Kentucky this year, one question was very common…. “Did you shoot the new Prime Logic CT9?” quickly followed by “Man that thing holds great at full draw.” It’s pretty agreed upon that the bare CT9 performs like it has stabilizers already installed. The TRM cams of the Prime Logic CT9 does a few key things. The cam’s wide profile, combined with the compression axle pins and strong wide split limbs, practically eliminates cam lean. This results in far less lateral nock travel during the power stroke of the shot. This aids tunability and helps the Prime Logic CT9 to achieve best in class accuracy. 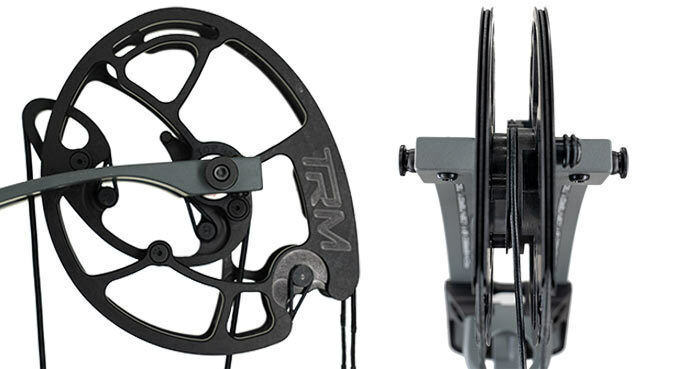 The TRM cams are also what makes center-grip technology possible. Their “parallel cam system” design utilizes a larger top cam that can pay out and take up more string during the shot which is necessary for perfectly level vertical nock travel. The risers on the Prime Logic CT9s are so stiff that they are often compared to a carbon fiber riser. Prime’s proprietary blend of aluminum is not only stronger, it is lighter than the competition’s aluminum. The riser has less give which ultimately results in less twist and better arrow flight. I installed the Sweet Spot training system on my CT9 and after the inventor Donnie Thacker saw my results, he noted how darn stiff the Prime risers are. Kind of makes the sweet spot less effective, but it is what it is! The Swerve is a breakthrough feature that was designed so the top of the riser and the bottom of the riser are not only as stiff as possible, but they react in unison under load. The end result is less later nock travel, less twisting of the riser during the shot. This not only allows the bow to shoot a wider range of spines with the same pinpoint accuracy, but archers may also notice that their pin is much closer to the center of the arrow/rest compared to the other bows. The Flexis AR cable guard system is adjustable so an archer and increase and decrease tension on the cams. With a maximum range of 3 full turns, if your bare shaft is showing a slight tear through paper, just adjust the Flexis AR cable guard to bring it to a perfect bullet hole. We ran our Prime Logic CT9 through a series of tests to see how well it performed. Let’s have a look at the results. For the speed test, we had our bow set around 57 lbs and at a 29-1/4″ draw length. We shot an arrow through our chronograph and compared the reading to TAPS (The Archery Program Software) estimated speed. Not to our surprise, we were dead on. Prime has always been truthful about their speeds and we have confirmed that with this test. 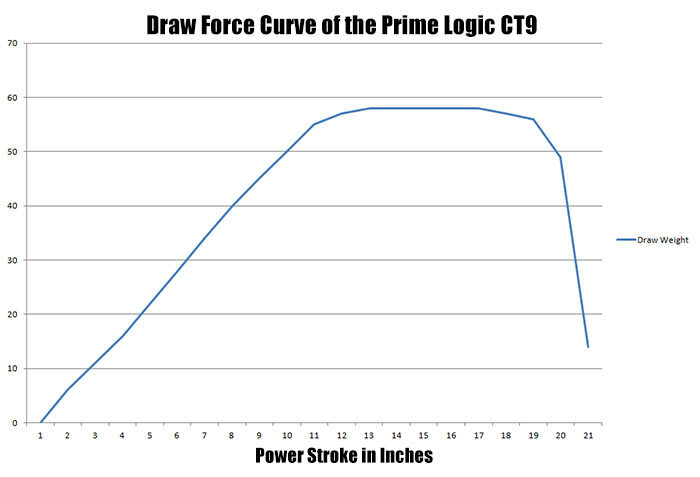 The Draw Cycle of the Prime Logic CT9 is a decent one. It gradually climbs up to its peak weight and then rides the peak weight for about 1/3 of the draw cycle before it drops off into the valley. The holding weight is adjustable by sliding the limb stops. Following suit of its predecessors, the CT9 is very easy to tune. This is in part to its build, but like any bow, you must have the timing, centershot and nocking point set properly. As expected, due to the limited lateral nock travel/bow torque, the Prime Logic CT9 can shoot a variety of arrow shafts with great success. The picture below shows how 3 drastically differently spined bare shaft arrows shot through paper at 20 feet. Not too bad!! For a look at the lateral nock travel of the Prime Logic CT9, we are going to turn to Joe Marzullo for one of his laser tests. He hasn’t tested the CT9, but has tested the CT5 which will produce very similar results. If anything, the CT9 would perform better than the CT5 due to its axle to axle measurement being 4 inches longer. A longer ATA results in less force on the cable guard. Either way, the video will reinforce how well the engineers at G5/Prime did while designing this bow. To test the vertical nock travel, we filmed a shot out of the CT9 at 960 frames per second. If you watch the overlaid red line, the arrow does a great job of staying level during the shot. This really shows how the design of the PCS cams are spot on. The Prime Logic CT9 is ONE HELL OF A BOW. Nothing is built like it. No other brand shoots like it. It’s a good thing that certain professional archers shoot for other manufacturers, because if a CT9 ever got into the hands of someone like Jesse Broadwater, nobody else would have a chance. There is only one thing we think can be improved on the CT9; the control over the center of the powerstroke of the string. If you have an arrow that doesn’t want to play nice (not a perfect rip through paper) you are really limited to using the Flexis AR cable guard to lessen or increase torque on the bow. During our testing of the Flexis AR System, we haven’t noticed a big change in arrow flight after adjustments. This is probably due to the riser and limbs being so rock solid. We think a shimming system of some sort may be a better solution. We have found that it is easier to fix minor left/right tears by just moving the rest a bit. Not a big deal. Overall, it’s a great bow. From the quality of the components to the brilliance of the engineering, this bow truly is years ahead of the other target bows on the market. The Prime Logic CT9 is already capturing many wins in 2019 and G5/Prime is swamped with demand. If you are in the market for a target bow, do yourself a favor and give the Prime Logic CT9 a try, you’ll be glad you did. For more information, visit https://www.g5prime.com/. The Prime Logic CT9 may be the best target bow ever made. Why is that? The design, the balance, the tunability, the performance… the list goes on and on. Definitely a bow to try if you’re in the market for a new target bow.